We spent Sunday celebrating this cutie turning 8. We made Mexican haystacks for dinner and played with cousins all day. 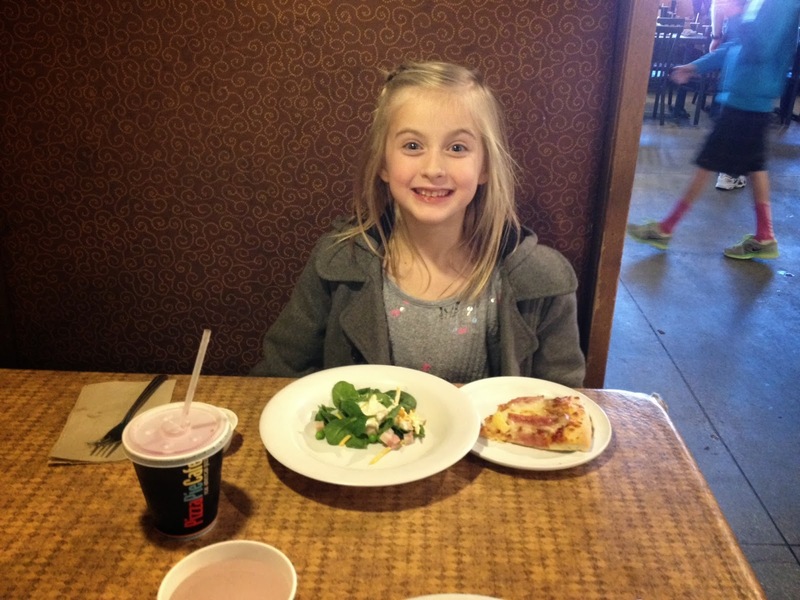 On Monday, there was no school so more cousin playing time and going out to lunch with her dad. Jeremy had to send me a photo to point out that she chose spinach salad from the pizza buffet. She wore her sparkle shirt so she could be a human disco ball as they drove in the convertible. It involves lots of singing loudly while posturing with her stomach. Spencer pointed out that birthdays around here last a lot longer than one day! Cousins left Monday afternoon and everyone had to return back to their normal routine. I wonder if kids will look back and remember the fun they had or the fact that I came down with a cold. Halfway through this week Spencer asked why I kept going to bed right after dinner. He had no idea that I felt bad and just thought I was loosing my voice and coughing so much because I had been cutting onions recently or something. I obviously need to be more vocal in my demanding to be given some TLC when sick. So I spent the week cleaning something, then watching part of Sherlock or staring into space for an hour and then repeating the process. But luckily it has left me and gone over to Spencer. So now he is laid flat by the fire with a fever and is making up for any silently suffering I might have done. He is not a quiet or patient sick person. Hopefully all these microbes leave our house before family comes this week or I will handing out anti-microbal wipes as they enter. So this week was pretty slow. Jeremy had a photo class he hosted Friday and Saturday that he went to. Friday night he rushed home to wisk me out to dinner while Spencer and Robyn did a Merlin marathon. And Saturday night after being gone all day he rushed home to join us to go to a BYU men's volleyball game. One of our favorite sports to watch. He is always so good about remembering family things.